It’s warm enough to play golf! 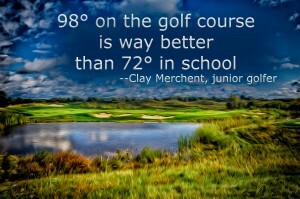 Well, it may not be 98 degrees, but it is warm enough to play golf without damaging the turf. It seems like winter lasted forever this year. We have a lot of exciting things to share with our friends in the coming months, but for the moment, the course is ready, and the golf carts are all charged up. Hope to see you soon! Looking forward to visiting Purgatory soon. Wish it warm up a little more.